Hello and happy Tuesday. It's time for another challenge at CASology. 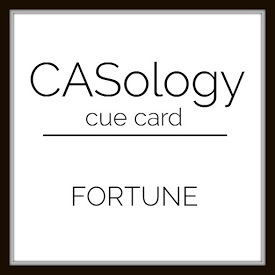 This week, our cue word is FORTUNE. I struggled a bit with this one, and I know my fellow Design Teamies did, too. But I know that you will find lots of inspiring ideas to help you play along with this cue word this week. This sentiment kind of reminds me of the sort of message you might see inside of a fortune cookie. and, the image reminded me of origami and I thought of those little paper fortune tellers we used to fold up when we were kids. See how the imagination can stretch? Now it's your turn. How does FORTUNE inspire you? I hope you play along this week. Please remember to keep it Clean and Simple. We are sponsored this week by Jaded Blossom Stamps. You nailed it, Joyce! I would have a difficult time with that cue too. Even the dry embossing lends to the look - it looks like bamboo. Fabulous card Joyce...I have to agree with you about your sentiment and it is a wonderful fortune too. Love your bamboo background, just perfect with your elephant. I like the window you created for the little origami elephant! This is pretty Joyce! I totally get your inspiration, Joyce. Now if I could think of something. Hi Joyce! This was a good choice ,the sentiment is like a fortune cookie! Love the card and colors! Very clever take on the cue card, Joyce! I love your origami elephant and how the sentiment looks just like a fortune cookie! Really fun card! I think you nailed the cur here Joyce! The sentiment is sending good fortune and the origami elephant is perfect. Thanks for sharing your creative process for arriving at this card from a simple "fortune" cue word. You totally nailed it! Love that you shared your creative process. The elephant is certainly a great choice. The blues are wonderful and your embossing is as always perfection!